In, Todays blog i am gonna tell you how to buy a top level .COM Domain which Google Adsense easily approve if your website have good and unique content and all the mandatory pages you intregate in your website. There are many many peoples who want to start a blog and think that they can earn money with there blogs with some free domains like (.tk , .xl , .OOO ) or any other free domains this type of free domain is good only for practicing like if you are a beginner and you want to learn how to create a website than you should go for this type of free domians but if you want to earn some money by placing the google adsense in your website than you should buy a top level domain(,such as .COM , .IN , .N .ORG) which was quite expensive for many peoples like student, thats why people go for the free domains create awesome website and when the apply for Google adsense than google simply reject there application (because google only show there ads only in TOP LEVEL domains) after doing so much of hardwork and gets rejected people depressed and quit blogging as well. So today, i am gonna help those peoples who are passionate about blogging but does not so much of funding for set up there blog or website so lets begin. as you can see the price of the domain is 623 now here was a trick you can see the promo code option simply paste a code COM88 then apply, after applying the promocode now you can see the price of you domains is only 1.02 dollars means only 70 rupees which is quite afforable for any one, now simply complete the payment via debit card or paypal. 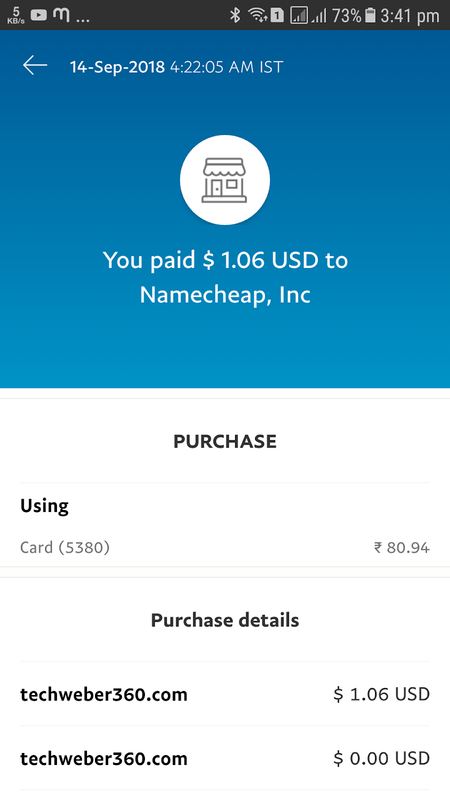 as you can see below i complete my order through paypal only 1.06 dollars, now enjoy the tricks and share with your friends so they can also save huge amount in domains. the trick is work only one time per account.